GE has signed a cooperative research agreement with King Abdullah University of Science & Technology (Kaust) to undertake cutting-edge research on enhancing the fuel flexibility of GE’s advanced gas turbines. The collaborative research, led by Saudi-based international professionals and students from Kaust along with GE’s global team, will focus on the impact of using heavy liquid fuels on advanced gas turbines. The goal of this groundbreaking study is to help advance the overall fuel flexibility of gas turbines, which in turn can positively impact power plant availability, enabling power producers to meet the growing demand for electricity in the kingdom. According to Bill Roberts, director, Kaust Clean Combustion Centre, the university’s cooperative research with GE is a strong example of the academic-industry linkages the university fosters. The collaborative research project, scheduled to begin this year, is co-funded by GE and Kaust. Research results will be evaluated by GE experts to determine feasibility. The collaborative research agreement is further proof of GE’s commitment to find ways to increase fuel flexibility across power plants and refineries in the kingdom. It also complements the concerted efforts of GE to build an innovation-led ecosystem, underlined by the research initiatives at the Saudi GE Innovation Centre in in Dhahran Techno-Valley. The centre works with and through the national ecosystem with localisation being the main focus. The facility works on customer business priorities, needs and issues that address the country’s challenges. GE’s advanced F-class gas turbines are the first to offer customers the ability to operate on crude oil. In December 2013, Saudi Electricity Company (SEC) and GE successfully field tested the first F-class gas turbine at Power Plant (PP) 11 operating on Arabian Super-Light (ASL) crude oil. GE’s latest 7F.05 gas turbines are expected to be commissioned on ASL as a backup fuel on projects such as SEC’s PP12 as well as SEC’s recently announced “Green Duna” Integrated Solar Combined Cycle Plant. 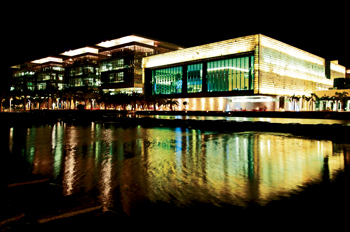 Kaust is an international, graduate-level research university located on the shores of the Red Sea in Saudi Arabia. The university is dedicated to advancing science and technology through interdisciplinary research, education and innovation. Curiosity-driven and goal-oriented research is conducted by students, faculty, scientists and engineers to address the world’s pressing scientific and technological challenges related to food, water, energy and the environment. GE Power & Water provides customers with a broad array of power generation, energy delivery and water process technologies to solve their challenges locally. Power & Water works in all areas of the energy industry including renewable resources such as wind and solar; biogas and alternative fuels; and coal, oil, natural gas and nuclear energy. The business also develops advanced technologies to help solve the world’s most complex challenges related to water availability and quality. Power & Water’s six business units include Distributed Power, Nuclear Energy, Power Generation Products, Power Generation Services, Renewable Energy and Water & Process Technologies. Headquartered in Schenectady, NY, Power & Water is GE’s largest industrial business.